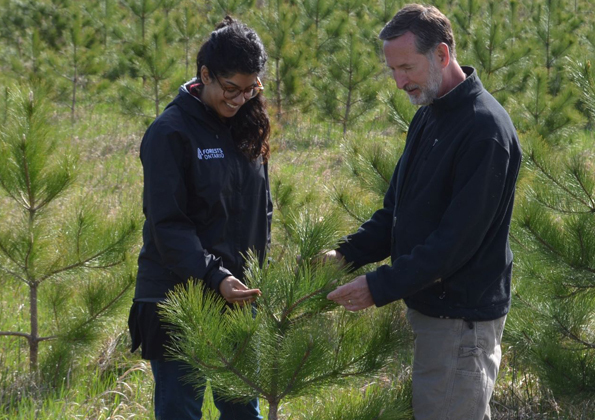 Azra Fazal and Wade Knight, of Forests Ontario, examine a planting as part of the 50 Million Tree Program, part of the United Nations’ Billion Tree Campaign. Forests Ontario is advising landowners considering planting trees next spring to plan ahead this fall. The stewardship organization can help through its 50 Million Tree Program, which is designed to make tree planting more affordable for those considering large-scale planting on their properties in the future. Landowners who have at least one hectare of open land available to plant may be eligible to receive 75-to-90 per cent coverage of their total planting costs through the program. Those who register will be contacted by a Forests Ontario representative to determine their eligibility and to register. The new trees can help rural landowners address a host of goals, including improvements to farm operations and efficiency, creating wildlife habitat, increasing property values, or addressing climate change. “Our goal is to plant the right tree in the right place and do all we can during planning and preparation to ensure the healthy long-term growth of newly planted trees,” said Tim Gray, a field advisor for Forests Ontario in a press release. Gray indicated that through the planning process, landowners can determine the most appropriate species of trees, assessing the condition of a planting site, and doing any preliminary work or treatment to accommodate the planned planting. Those making contact early have a better chance of securing the right number and most appropriate species of tree. Those interested in the program can visit the website forestsontario.ca or contact forestry program manager Stephanie Burns at 1-877-646-1193 ext 222.